The view on the Birds of Prey course at Beaver Creek recently (Vail Valley Foundation photo). After a warm, dry start to Thanksgiving week, a pair of storms were set to freshen up the skiing conditions at Vail and Beaver Creek starting Thanksgiving night and lasting into Sunday. No major terrain openings to report on Wednesday, although the Bachelor Gulch Express lift in Arrowhead started running on Wednesday. For now, however, there’s no skier connection to Beaver Creek. Opensnow.com is predicting 2 to 6 inches of new snow by Friday morning, followed by up to another foot of new snow by Sunday. Conditions were holding up nicely throughout the week at both mountains, with above-average early-season snow opening up hundreds of acres of skiing earlier than scheduled. On Wednesday, Chair 5 at Vail was running, although the Back Bowls remain closed. Likely just testing the lift ahead of a back-side rope-drop in the next week or two. But if the next two storms produce as expected, look for possible Back Bowl openings by the weekend. 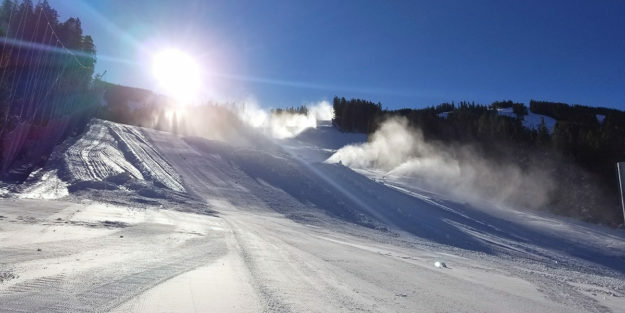 At Beaver Creek, the Birds of Prey downhill course has been given the go-ahead by International Ski Federation officials ahead of next week’s World Cup races, Nov. 30—Dec. 2. Go to the Vail Valley Foundation website for more info, and check snow.com for recreational ski conditions. BEAVER CREEK, Colo. – Nov. 21, 2018 – Today, Beaver Creek Resort began operating Bachelor Gulch Express Lift (#16) with skiing and snowboarding on Sawbuck. There will not be skiing access between Bachelor Gulch and Beaver Creek Village. Mamie’s Mountain Grill will open for the season on Friday, Nov. 23.